Raiders used a sledge hammer to try and smash their way into a Peterborough city centre jewellers. 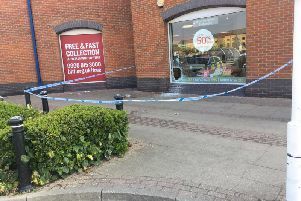 The men struck at Fraser Hart in Queensgate early this morning (Thursday). Queensgate was closed at the time. A Cambridgeshire police spokesman said: “It is believed five people wearing balaclavas forced their way through the centre’s doors near Exchange Street at about 3am this morning (August 25). “They then used sledgehammers to smash their way into Fraser Hart jewellers before making off with jewellery worth tens of thousands of pounds. “They left the way they came and ran off in the direction of Bridge Street, possibly making off behind the Town Hall. Detective Sergeant Adam Fraser said: “I would ask anyone who was in the city centre in the early hours of today to consider whether they saw anything that could help this investigation. “This appears to have been an organised raid in which a specific jewellers has been targeted. Photos taken at the scene show shattered glass, and the sledge hammer left by the door. Cambridgeshire police have said they are ‘keeping an open mind’ about whether a series of arsons which took place in Peterborough city centre are connected to the raid. The arsons took place between 3pm and 4pm in near-by Priestgate, Cowgate, Long Causeway and Cross Street. Officers are also in contact with other police forces across the country, as similar raids have been carried out in other towns and cities in the past.